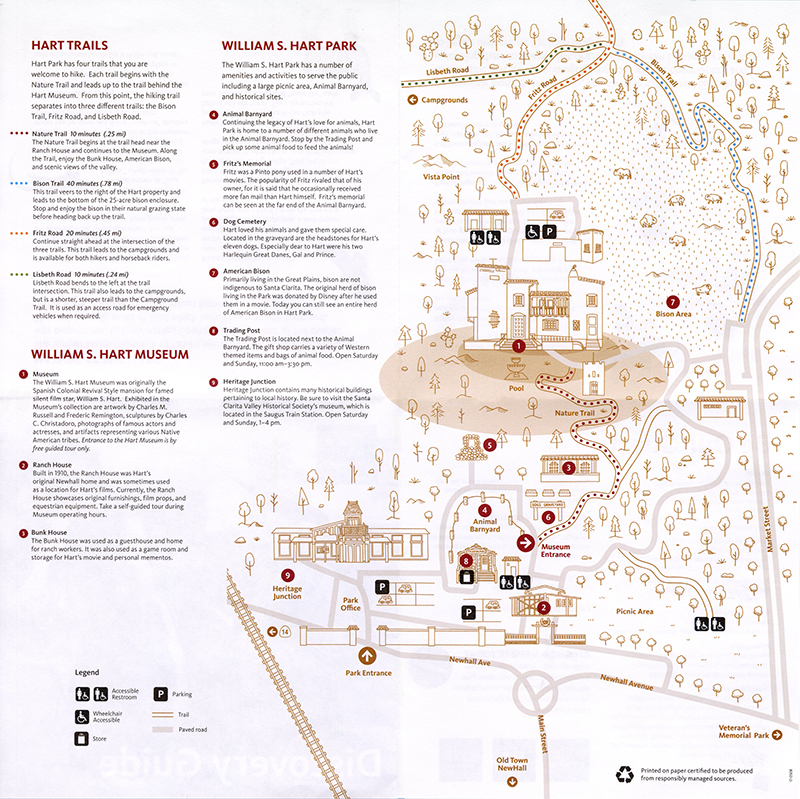 SCVHistory.com MU1801 | William S. Hart Park & Museum Discovery Guide & Map, NHMLA 2017. William S. Hart Park & Museum. The William S. Hart Park and Museum, a member of the Natural History Museum of Los Angeles County, is the former retirement home of the famed silent film actor and director who produced a series of hit Western movies in the early 1900's. His beautiful Spanish Colonial Revival Style Mansion — now the Museum — exhibits an impressive collection of Western artwork by noted artists Charles M. Russell, Frederic Remington, and Joe de Yong, as well as mementos from early Hollywood, personal furnishings and effects, and artifacts representing multiple Native American cultures. The Museum also includes an historic 1910 Ranch House that exhibits Hart's tack and saddle collection, personal furnishings, and additional Hollywood mementos. Both the Mansion and the Ranch House are located in scenic William S. Hart Park, where guests may enjoy visiting a live collection of farm animals, a herd of American bison, a vast picnic area, a series of hiking trails, and a charming Western-themed Gift Store. As Mr. Hart's gift to the public, visiting the Park and Museum is always free. MU1801: Download individual pages here.